Philip was the Curator of the Maize Genetics Cooperation - Stock Center (1993-2019). His duties included collecting, documenting, and propagating the thousands of mutants that have been discovered by corn geneticists, breeders, and farmers over the years. In addition, Phil has made his own contributions to the field of corn genetics by discovering and characterizing new mutants. This research was started in the laboratory of Dr. Donald S. Robertson at Iowa State University in 1982 and continued in the laboratory of Dr. Patrick Schnable at Iowa State beginning in 1991. 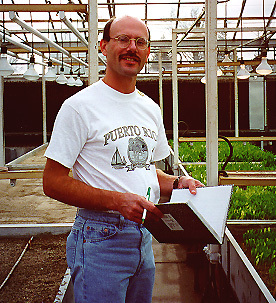 Phil joined the Maize Genetics Cooperation - Stock Center in 1993, and continued his research in starch biosynthetic mutants (sugary3 and amylose extender1), aleurone color mutants (dilute aleurone1, brown aleurone1, and John Deere Corn), and various other seedling, kernel, and mature plant mutants. Further information and publications can be found here.